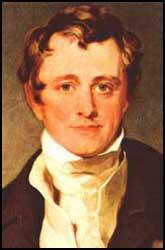 Humphry Davy, a woodcarver's son, was born in Penzance in 1778. After being educated in Truro, Davy was apprenticed to a Penzance surgeon. In 1797 he took up chemistry and was taken on by Thomas Beddoes, as an assistant at his Medical Pneumatic Institution in Bristol. Here he experimented with various new gases and discovered the anesthetic effect of laughing gas (nitrous oxide). Davy published details of his research in his book Researches, Chemical and Philosophical (1799). This led to Davy being appointed as a lecturer at the Royal Institution. He was a talented teacher and his lectures attracted large audiences. In 1806 Davy published On Some Chemical Agencies of Electricity. The following year he discovered that the alkalis and alkaline earths are compound substances formed by oxygen united with metallic bases. He also used electrolysis to discover new metals such as potassium, sodium, barium, strontium, calcium and magnesium. 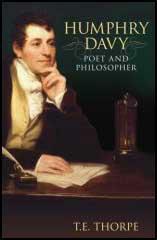 Davy was now considered to be Britain's leading scientist and in 1812 was knighted by George III. His biographer, David Knight, wrote: "On 8 April 1812 Davy was knighted by the prince regent, and on the 11th he and Jane Apreece were married by the bishop of Carlisle at Jane's mother's house in Portland Place. They spent their honeymoon in Scotland, staying with eminent people; Davy took his little apparatus with him, and conducted some researches on gunpowder. He gave up his courses of lectures, and wrote up his Elements of Chemical Philosophy the same year. This, dedicated to Jane, dealt with his own work, and was meant to be the first of a multi-volume set, but it did not sell well, for it was not a satisfactory textbook and his researches were accessible in the Royal Society's Philosophical Transactions." Michael Faraday saw Davy lecture in 1813: "Sir H. Davy proceeded to make a few observations on the connections of science with other parts of polished and social life. Here it would be impossible for me to follow him. I should merely injure and destroy the beautiful and sublime observations that fell from his lips. He spoke in the most energetic and luminous manner of the Advancement of the Arts and Sciences. Of the connection that had always existed between them and other parts of a Nation's economy. During the whole of these observations his delivery was easy, his diction elegant, his tone good and his sentiments sublime." In 1813 Faraday became his temporary assistant and spent the next 18 months touring Europe while during Davy's investigations into his theory of volcanic action. In 1815 Humphry Davy invented a safety lamp for use in gassy coalmines, allowing deep coal seams to be mined despite the presence of firedamp (methane). This led to some controversy as George Stephenson, working in a colliery near Newcastle, also produced a safety lamp that year. Both men claimed that they were first to come up with this invention. Stephenson wrote in The Philosophical Magazine in 1817: "The principles upon which a safety lamp might be constructed I stated to several persons long before Sir Humphrey Davy came into this part of the country. The plan of such a lamp was seen by several and the lamp itself was in the hands of the manufacturers during the time he was here." One of Davy's most important contributions to history was that he encouraged manufacturers to take a scientific approach to production. His discoveries in chemistry helped to improve several industries including agriculture, mining and tanning. 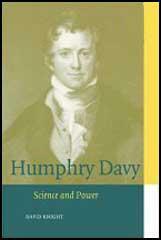 Sir Humphry Davy died in 1829. I observe you have thought proper to insert the last number of The Philosophical Magazine your opinion that my attempts at the safety tubes and apertures were borrowed from what I have heard of Sir Humprey Davy's researches. The principles upon which a safety lamp might be constructed I stated to several persons long before Sir Humphrey Davy came into this part of the country. The plan of such a lamp was seen by several and the lamp itself was in the hands of the manufacturers during the time he was here. It will hereafter be scarcely believed that an invention so eminently scientific, and which could never have been derived but from the sterling treasury of science, should have been claimed on behalf of an engine-wright of Killingworth, of the name of Stephenson - a person not even possessing a knowledge of the elements of chemistry. (3) In 1813 Michael Faraday wrote about the lectures by Humphry Davy. Sir H. Davy proceeded to make a few observations on the connections of science with other parts of polished and social life. Here it would be impossible for me to follow him. I should merely injure and destroy the beautiful and sublime observations that fell from his lips. He spoke in the most energetic and luminous manner of the Advancement of the Arts and Sciences. Of the connection that had always existed between them and other parts of a Nation's economy. During the whole of these observations his delivery was easy, his diction elegant, his tone good and his sentiments sublime.